Re-posting here a NY Times article By PAM BELLUCK Published: April 18, 2011, that so eloquently explains the logical effects of music most of us just feel and take for granted…. The other day, Paul Simon was rehearsing a favorite song: his own “Darling Lorraine,” about a love that starts hot but turns very cold. He found himself thinking about a three-note rhythmic pattern near the end, where Lorraine (spoiler alert) gets sick and dies. Interactive Feature What Makes Music Expressive? TEMPO AND DYNAMICS Daniel J. Levitin of McGill University in Montreal researches the effects of music on listeners. “The song has that triplet going on underneath that pushes it along, and at a certain point I wanted it to stop because the story suddenly turns very serious,” Mr. Simon said in an interview. The results are contributing to a greater understanding of how the brain works and of the importance of music in human development, communication and cognition, and even as a potential therapeutic tool. Research is showing, for example, that our brains understand music not only as emotional diversion, but also as a form of motion and activity. The same areas of the brain that activate when we swing a golf club or sign our name also engage when we hear expressive moments in music. Brain regions associated with empathy are activated, too, even for listeners who are not musicians. And what really communicates emotion may not be melody or rhythm, but moments when musicians make subtle changes to the those musical patterns. After the Mozart mishap, Dr. Levitin and a graduate student, Anjali Bhatara, decided to try teasing apart some elements of musical expression in a rigorous scientific way. To decipher the contribution of different musical flavorings, they had Thomas Plaunt, chairman of McGill’s piano department, perform snatches of several Chopin nocturnes on a Disklavier, a piano with sensors under each key recording how long he held each note and how hard he struck each key (a measure of how loud each note sounded). The note-by-note data was useful because musicians rarely perform exactly the way the music is written on the page — rather, they add interpretation and personality to a piece by lingering on some notes and quickly releasing others, playing some louder, others softer. They created other versions too: a 50 percent version, with note lengths and volume halfway between the mechanical average and the original, and versions at 25 percent, 75 percent, and even 125 percent and 150 percent, in which the pianist’s loud notes were even louder, his longest-held notes even longer. But it was not just changes in volume and timing that moved them. Versions with even more variation than the original, at 125 percent and 150 percent, did not strike listeners as more emotional. And random versions with volume and note-length changes arbitrarily sprinkled throughout made almost no impression. All of this makes perfect sense to Paul Simon. Dr. Levitin’s results suggest that the more surprising moments in a piece, the more emotion listeners perceive — if those moments seem logical in context. The departure “could be something incredibly slight that means something huge, or it could be very large but that’s actually a fake-out,” Mr. Ma said. The brain processes musical nuance in many ways, it turns out. 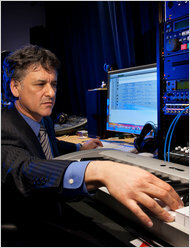 Edward W. Large, a music scientist at Florida Atlantic University, scanned the brains of people with and without experience playing music as they listened to two versions of a Chopin étude: one recorded by a pianist, the other stripped down to a literal version of what Chopin wrote, without human-induced variations in timing and dynamics. During the original performance, brain areas linked to emotion activated much more than with the uninflected version, showing bursts of activity with each deviation in timing or volume. So did the mirror neuron system, a set of brain regions previously shown to become engaged when a person watches someone doing an activity the observer knows how to do — dancers watching videos of dance, for example. But in Dr. Large’s study, mirror neuron regions flashed even in nonmusicians. Maybe those regions, which include some language areas, are “tapping into empathy,” he said, “as though you’re feeling an emotion that is being conveyed by a performer on stage,” and the brain is mirroring those emotions. Regions involved in motor activity, everything from knitting to sprinting, also lighted up with changes in timing and volume. Anders Friberg, a music scientist at KTH Royal Institute of Technology in Sweden, found that the speed patterns of people’s natural movements — moving a hand from one place to another on a desk or jogging and slowing to stop — match tempo changes in music that listeners rate as most pleasing. The Levitin project found that musicians were more sensitive to changes in volume and timing than nonmusicians. That echoes research by Nina Kraus , a neurobiologist at Northwestern University, which showed that musicians are better at hearing sound against background noise, and that their brains expend less energy detecting emotion in babies’ cries. The ability to keep time to music appears to be almost unique to humans — not counting Snowball the cockatoo, which dances in time to “Everybody,” by the Backstreet Boys, and became a YouTube sensation. Both the Levitin and the Large studies found that the timing of notes was more important than loudness or softness in people’s perceptions of emotion in music. Changes in the expected timing of a note might generate the emotional equivalent of “depth perception, where slightly different images going to your two eyes allows you to see depth,” said Joseph E. LeDoux, a neuroscientist at New York University. Musicians like Mr. Simon consider slight timing variations so crucial that they eschew the drum machines commonly used in recordings. Dr. Levitin says Stevie Wonder uses a drum machine because it has so many percussion voices, but inserts human-inflected alterations, essentially mistakes, so beats do not always line up perfectly. And Geoff Emerick, a recording engineer for the Beatles, said: “Often when we were recording some of those Beatles rhythm tracks, there might be an error incorporated, and you would say, ‘That error sounds rather good,’ and we would actually elaborate on that. Of course, science has not figured out how to measure other elements of musical expression, including tone, timbre, harmonics and how audience interaction changes what musicians do. While there may be some consensus about what makes music expressive, performers say it is hardly immutable. Ms. Cash, who on a recent road trip listened to multiple versions of Chopin nocturnes and quizzed herself on which pianist she preferred, learned a lot about musical flexibility after developing polyps on her vocal cords in 1998. “Because of these little polyps I’ve had to learn how to resing some of our songs, use breath where I used to use force, use force where I used to go delicate,” she said. In Dr. Levitin’s lab, Mr. McFerrin gamely tried several experiments, including seeing how long he could hold his hand in ice water while listening to different types of music (an effort to find out if music can ameliorate pain). He described a story by Hermann Hesse in which a violinist, granted his wish to be the best musician he can be, vanishes as soon as he starts to play.